This entry was posted on August 29, 2017 by Remy Albillar. Flinging a basketball through a hoop is hard enough without somebody guarding you. That’s why the NBA’s top ballers, stars like Russell Westbrook, Kyrie Irving and Kevin Durant, have dozens of moves for getting around their defenders. When it comes building your brand through social media, your business will run into interference as well. If you’re planning to engage with potential customers, market your services and expand your brand via social media, you will be dealing with online trolls. There’s no way around it. Thankfully, there are several lessons that your brand can learn from the NBA – yes, really – when it comes to dealing with malicious commenters. Keep reading to learn a few helpful plays that you can use whenever a troll stands between you and a social media victory. When future-Hall-of-Famer Dwyane Wade makes a hard drive for the basket, he already knows his move is going to attract attention from defenders. That’s why he’s already got a few counter strategies (a spin, a pump fake, his patented Euro step) queued up and ready to go in case he faces resistance. By anticipating the defense and preparing a response in advance, Dwayne Wade makes it considerably easier to score, despite the presence of an opposing player. When it comes to posting on social media, you’ll have to take a similar approach to trolls. If your company recognizes that a social media post may provoke strong opinions or potential ridicule, then it makes sense to prepare responses in advance. The more accurately you anticipate the type of negative responses a post could inspire, the more efficiently your company can respond to trolls and regain control of your messaging. Despite being much maligned for his inconsistent defense and tendency to disappear during big games, All-Star power forward Kevin Love remains one of the best rebounders in the league. How does Kevin do it? He stays focused on leveraging his strengths and always positions himself properly to get the better of his opponents. Once he has the rebound, Love is able to control the play and help his team score a basket on other end of the floor. Your brand can take the same approach when wrestling with social media trolls in the comment section of any post. By communicating the facts that support your company’s position, including any relevant data or research, you can turn a troll’s negative post into a learning experience for the rest of your audience. Any time you identify and point out misinformation shared by trolls, your brand demonstrates both their expertise and their professionalism in handling negative feedback. Much like a rebound in basketball, this approach turns shots against your company into a quick win for your brand. This approach was not only effective in making Porzingis seem like a classy guy; it also directed praise toward his organization, the Knicks, and their decision to draft a mature, self-aware prospect. You company must take the same approach when it comes to dealing with social media trolls. Instead of viewing these instances as obstacles, a more proactive approach is to treat trolls as an opportunity to highlight the brand’s values and expertise. There’s nothing trolls hate more than having the spotlight stolen from them. Your brand can elevate its reputation on social media while also deterring future abuse by learning to turn negative comments to your advantage. 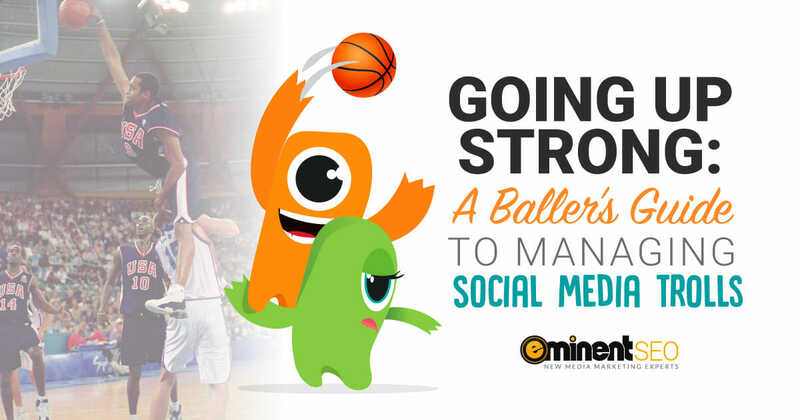 Now that you’re familiar with the fundamentals of the game, it’s time to raise your social media IQ. The following technical fouls are not so much tips for getting around trolls as they are common mistakes to avoid when dealing with them. One of the oldest tricks in the book is mimicking a shooting motion, just to watch your defender overcommit and open up a path for you to score. Trolls commonly post provocative, offensive statements in comment sections with the sole purpose of getting someone riled up and into an argument. “Deflect and diffuse” should always be your go-to strategy when it comes to managing negative social media comments. Getting into an extended argument with a troll is a bad idea. Actually hurling insults back and forth with the troll is unacceptable. Not only does this behavior compromise your company’s professionalism, it also speaks contrary to the values your company is supposed to stand for. You are better off deleting the comment than getting caught insulting consumers in your comment section. At the end of the day, internet trolls are more than likely not your major audience. They may be engaging with your brand online, but this engagement does very little for your bottom line. However, potential customers are observing your behavior on social media, even if they choose not to engage. How you handle trolls says a lot about your company. A strategic, intentional approach to negative social media activity is far more likely to impress observers than an off-the-cuff, snarky rebuttal. Brand management is just one of the reasons that social media is so important for your company. Without an effective game plan, it’s only a matter of time before your social media strategy bottoms out. Please browse through our other blog articles for more tips on managing responses to your brand messaging. You can also reach out to us and learn more if your business is in dire need of a revitalized social media strategy. This entry was posted in Social Media and tagged Reputation Management. I love when companies act ‘sassy’ or ‘clap back’ to annoying tweets directed at them. Obviously these people are just trying to get a rise out of the company, but instead they look dumb, and it will most likely go viral. Having funny replies can get your name out there as a business and people will want to support your laid back, humorous company. Social media trolls are very disgusting for a person or a brand. I think your post well helps me a lot from getting out of it. Your last three points are really helping me. Let’s see what happen. Glad you appreciated it. Thanks for reading!